At Grinview Smiles, we understand that losing your teeth can be a traumatic experience, and images throughout popular culture of ill-fitting dentures falling out at the most inopportune moment don’t help the process. Dr. Michael Grier wants you to know that modern dentures are a far cry from those of dentistry’s past. Custom dentures from Grinview Smiles look, feel, and function just like your natural teeth. We can even give you a brand new smile in a single appointment. With the revolutionary All-on-5, Teeth in a Day system, we have the power to take our patients from missing teeth, to dental implants, to a beautiful full arch in a single appointment! What used to require multiple appointments, several months of healing time and temporary restorations can now be completed in just one visit with Dr. Michael Grier. We recommend Teeth in a Day to patients who are missing most or all of their natural teeth, who still have a healthy enough jawbone to support implants. The All-on-5 system uses the minimum number of implants (5) to support the maximum number of teeth (a full arch). This is the best way to preserve your oral and jawbone health, and the most secure way to replace missing teeth permanently. 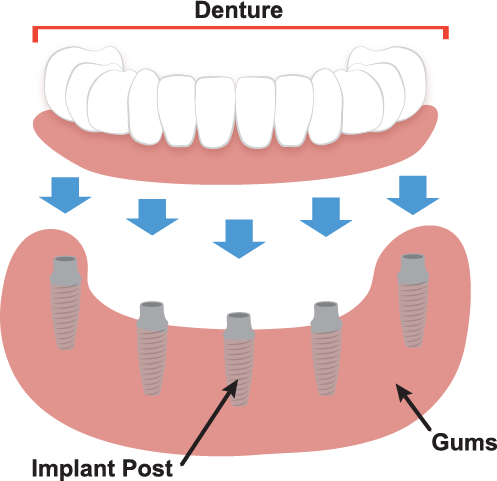 If you are not a candidate for dental implants, we have traditional denture options available to you as well. If you’re ready for a new smile in a single appointment, you’ve come to the right place! If you have any questions about dentures, or would like to schedule a consultation with your Grandview denture dentist – Dr. Michael Grier at Grinview Smiles – give us a call today at (817) 866-2065.